Half Summer faery princess, half human, Meghan has never fit in anywhere. Deserted by the Winter prince she thought loved her, she isprisoner to the Winter faery queen. Aswar looms between Summer and Winter, Meghan knows that the real danger comes from the Iron fey—ironbound faeries that only she and her absent prince have seen. But no one believes her. Once I start a series, I like to get through all of the books before moving on. So although I just reviewed The Iron King, I figured I’d chug along and do them all. 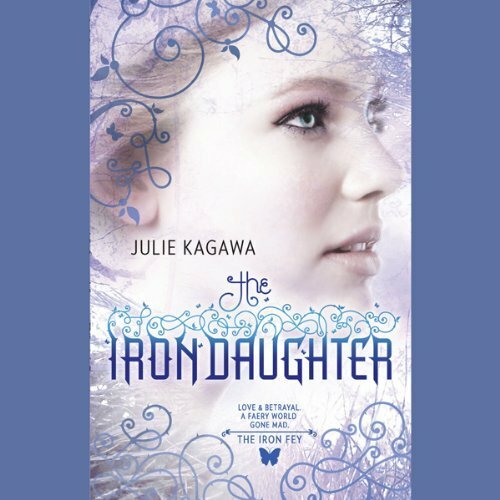 In the second installment of Ms. Kagawa’s Iron Fey series, The Iron Daughter, I was quite pleased with the twists and turns it took and the new characters it introduced. This series has quickly become a YA read that I feel good about recommending. Of course, love, love, loving the narration helps any novel/series reach a higher plane and Khristine Hvam makes these books soar. Just a word of advice: To get the full impact of Meghan’s journey from book one to book two, read the novella “Winter’s Passage” prior to diving into book two. Meghan’s story in The Iron Daughter begins with her fulfillment of the bargain she made with Prince Ash. In Iron King, she vowed she would return with him to Winter Court, essentially becomingprisoner to the Winter Queen, in exchange for his help in finding her little brother. Ash has become even icier than before in order to “save face” in front of his family…or so it appears. This is devastating to the love struck princess (of course….’cause this is a YA novel and where would we be without a young girl being stupid enough to question the love of a boy who so CLEARLY loves her!! Argh!). Even more devastating is when she realizes that her emotions for Puck have grown deep and are leaving her more confused than ever. Ooooh, can you say love triangle?? While imprisoned, Meghan witnesses a terrible act and is accused of crimes she didn’t commit. This causes a chain of events beginning with her being turned into a human (actually half-human if we’re getting technical) Popsicle and ending with a war between the Winter and Summer Courts. Along the way, we meet some fantastic characters, gasp as we realize that Ash has become the enemy, gasp again at the image of him in a tux, gasp/grin again at the image of our beloved Puck all cleaned up (and MAN do I want to see Puck decked out in his formal attire! ), cheer for Meghan as she harnesses some of her power and are saddened by the loss of an honorable fey. Questions are answered, more questions are raised and we are left feeling a wonderful sense of camaraderie for Ms. Kagawa’s creations. With the maelstrom of activity in this installment, it would be easy to get lost or confused. Not the case. Again, she leaves me wanting to learn more about the characters and their amazing journey together. As with any review, along with the good…comes the not-so-good. Only a few times did I find myself doing the eye-roll thing…mostly at Meghan and her stupid teenage self. I also found it odd that the main antagonist was sorta dropped into the story with a plunk. Having a main character gasp her name didn’t make her seem more familiar…it just made me go, “Huh? Who’s that?”. I know there were a few other times when I felt annoyed but if I’m having a hard time remembering them, they aren’t worth mentioning. Khristine Hvam’s narration, as usual, was an absolute JOY to listen to. The voice she gave to Virus was perfection (think Jennifer Tilly). And, have you ever been talking on the phone, and you can hear the emotion in the other person’s voice? That is precisely how she narrates. You can tell when Puck’s smiling and being his wiley self…you can also feel the sadness and heartache when our boy’s heart is breaking. I love starting a book on audio with a great narrator and then reading it as the written word when I’m winding down before bed. You can still hear the voices as they should be and it makes everything more enjoyable. In case you’re confused and I haven’t been clear….Khristine Hvam is FANFREAKINGTASTIC! I was convinced with Terra’s review of the Iron king, now I can’t wait to get into this series.